People rally, holding portraits of slain journalist Anna Politkovskaya, in downtown Moscow. The Novaya Gazeta newspaper is remembering its award-winning journalist Anna Politkovskaya, who was killed 10 years ago in central Moscow. She became a symbol of Russian investigative journalism and although the government says her murder has been solved, her colleagues disagree, with the identity of the person who ordered the killing still a mystery. Ten years after the assassination of Novaya Gazeta journalist Anna Politkovskaya changed the landscape of Russian journalism forever, memorial protests are being held in Moscow under the slogan "The sponsor is still at large." A multiple award-winning correspondent for the newspaper, which is renowned for its hard-hitting investigative journalism and its opposition to the Kremlin, Politkovskaya was shot at point blank range in the elevator of her apartment building in central Moscow on Oct. 7, 2006. While the government claims the case has been solved, the identity of the person who ordered the killing remains unknown. 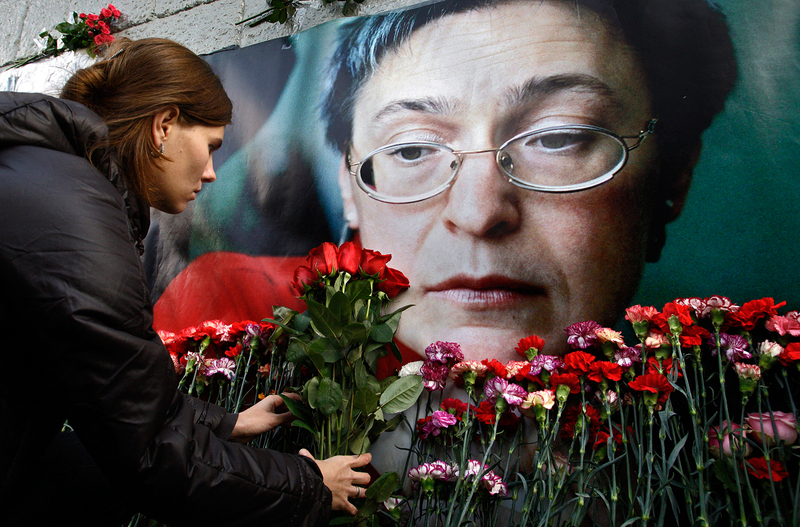 Politkovskaya’s central themes were crime and corruption in the security forces (FSB) and Chechnya, including the tortures in the region, violations of human rights and the crimes behind which, according to her information, stood the republic's leadership. Politkovskaya's colleagues have posted a so-called "video picket" on their site (the video shows them holding posters with the main facts, the milestones in the murder investigation and questions for the investigators). They also hung posters from the newspaper's building. On the newspaper's website deputy editor-in-chief Sergei Sokolov explained why he and his colleagues think the murder has still not been solved. "The journalists ask: what do we, Novaya Gazeta employees, feel on this day – October 7, 2016, 10 years after a fragile, courageous, beautiful and strong woman – Anna Politkovskaya – was shot at point blank range on the threshold of her building? I respond – rage." This is how Sergei Sokolov's column begins, explaining why the author and his colleagues do not believe the statements made by the Prosecutor General and the Investigative Committee about the crime being solved. "You cannot consider a political murder solved only because the executors have been convicted. It cannot be solved until the sponsor is found," writes Sokolov. He reminds everyone that only a few days after the murder, the Prosecutor General said that the possible sponsor was exiled oligarch Boris Berezovsky, who lived in London and was once Vladimir Putin's "godfather," only to subsequently become his "number one enemy." "The sponsor is one of the oligarchs and is an enemy of Russia, hiding abroad," claimed investigators, ignoring Politkovskaya’s history of harsh criticism of the Kremlin, the FSB and the Chechen leadership. Novaya Gazeta dismissed this theory, stating following its own investigation that the Chechen security forces were responsible for the murder. The first trial ended with the suspects' acquittal due to lack of sufficient evidence. Only during the second trial (2013) did the court officially recognize that Interior Ministry collaborators and FSB agents participated in the murder. In total six people were convicted – the organizers and the executors of the murder. Those who ordered the killing were not identified. Only one investigator, who was also alone in investigating the murder of Paul Khlebnikov, editor-in-chief of Russian Forbes, was left to search for the sponsor. Then the investigator retired and Politkovskaya's case was divided. "Later nothing was known about the investigation. The sponsor can let out a sigh of relief and order another murder, if of course he hasn't done so already," remarked Sokolov. Politkovskaya was killed two days after the birthday of Chechen President Ramzan Kadyrov and on the birthday of President Vladimir Putin. She made no secret of her opposition to both men. Ever since, photo galleries dedicated to the Russian president on Oct. 7 are accompanied in the mass media by photos in memory of Politkovskaya, while her death has become one of the most resonant political murders in Russian contemporary history. While criticical of Russia’s war in Chechnya and the crimes committed by the Kremlin-backed Chechen administration after the restoration of order in the Caucasus republic, Politkovskaya gained sympathy among Chechen nationalists for her coverage of the conflict. In 2002 the terrorists who seized a Moscow theater during the so-called “Nord-Ost” hostage crisis said that she was one of the people with whom they would be willing to speak. When on Sept. 1, 2004 terrorists seized a school in the North Caucasus town of Beslan, Politkovskaya flew to help negotiate the release of the hostages but fell ill and lost consciousness after drinking poisoned tea on the plane, which her colleagues interpreted as an assassination attempt. Politkovskaya's last publication in Novaya Gazeta was on the activity of Chechen units fighting on the side of federal forces and was called "Punitive Conspiracy." Her next article in the newspaper was supposed to be one on the use of torture in Chechnya and the involvement of the then Chechen Prime Minister Ramzan Kadyrov in local kidnappings. Read more: What is the lesson of Beslan?